Home / FT Lite/ Eating smart at Cafe Nuga! 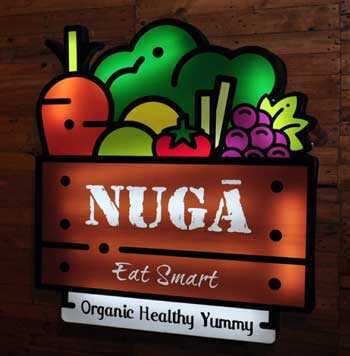 Eating smart at Cafe Nuga! Cafe Nuga is the latest eatery promoting healthy living in Colombo – a fast-growing niche in a competitive restaurant space – and just like their produce, they’re fresh on the scene having opened its doors on 22 March. Located at the end of Green Path, just past the roundabout, their colourful board is not hard to miss as it urges you to “Eat Smart,” while promising “Organic, Healthy, Yummy” goodies. Parking space is just about enough for a couple of cars, but that shouldn’t be too much of a concern as the diner itself can only accommodate about 30 people – though expansion plans are in the pipeline. At the moment, while the central areas are reserved for dining – with a cosy corner reserved for some live music – one fairly-large space in the corner houses a little shop full of shelves of organic and healthy items, while the other holds the pay point and a display of dessert items such as cakes and tarts. The restaurant’s decor is definitely on the more minimal side as cane chairs are matched with wooden tables and benches. A few positive quotes have also been hung up on the walls to complete the vibe. But where Cafe Nuga really looks to differentiate itself apart is in its menu which, while already among the more extensive we’ve seen, is really set apart by the helpfully-labelled vegan dishes – one for each section. In true cafe style the entire menu takes up just one piece of cardboard – one side for food, the other for drinks – but don’t let that fool you, they certainly make an effort to have you covered whatever your craving may be. Salads, omelettes, paninis and open sandwiches, pasta, wraps, grilled items, rice-based dishes, add-ons, juices, coffee, iced tea, Sri Lankan hot tea, and smoothies are all neatly tucked away under sub-labels of their own. Meanwhile there is also a special section for the fairly self-explanatory ‘meal in a bowl,’ which offers three options of vegan (Rs. 690), chicken (Rs. 790), and prawn (Rs. 940) served with rice noodles and a host of veggies in either a seafood, chicken or vegetable broth. Given the price and the quantity, this is a veritable steal, especially if you’re of the vegan persuasion. We did manage to try a handful of vegan dishes and speaking as someone who enjoys their meat and dairy, I can’t say I felt like I was missing out. The first was the modestly-titled ‘Hummus’ (Rs. 500), which while not technically a vegan dish due to the presence of pita bread, was given the all-clear by my vegan dining companion as the bread was optional. Apart from the bread, the dish came with a variety of veggies, such as carrot sticks, cucumber, lettuce, celery, gherkin sticks, and olives, all of which meshed wonderfully with delicious hummus. A special note of mention also should go towards the homemade pita, which was positively otherworldly. Next up was arguably the dish of the night, the Sweet Potato Chick Pea Burrito Bowl (Rs. 650) – a dish that I regrettably was unable to polish off, but not for the lack of trying. Served with an exquisite tahini dressing on a bed of Mexican rice, comes perfectly roasted sweet potatoes, onions, broccoli, and deliciously crispy chickpeas. Despite the lack of meat or dairy, the dish still managed to hit all its marks, with texture, flavour, freshness and colour oozing out of every spoonful. Highly recommend. Moving on to the bread and butter, so to speak, let’s first do away with the bad. In a brief chat with co-founder Sashika Gunatilleke, she revealed that one of the toughest aspects of starting a new restaurant is the teething problems, namely, consistency. As such, with the restaurant not even three months old it was no surprise that one of the dishes was quite a bit below par. Cafe Nuga offers a host of grilled options, of which we ordered the Seafood Grill (Rs. 1,400). Right off the bat it was underwhelming, in that while it was supposed come with prawns, calamari, and a fish fillet, we were only served the latter two – prawns being unavailable – of which both were poorly seasoned and overcooked. The only redeeming aspects were two delicious homemade dips, and carefully-roasted corn on the cob. But like I said, consistency is key, and our final dish made us forget all about the abysmal grill. The Pulled Mutton Panini (Rs. 1,100) is probably a little on the steep side, but after that first bite it becomes all so worth it. Soft homemade bread is filled with avocado sour cream, iceberg lettuce, tomato, onions, green chilli, jalapeños, and a more than generous serving of pulled mutton, while a side of fried manioc chips completes the decadent experience. A dish only second to the vegan burrito bowl on the night. 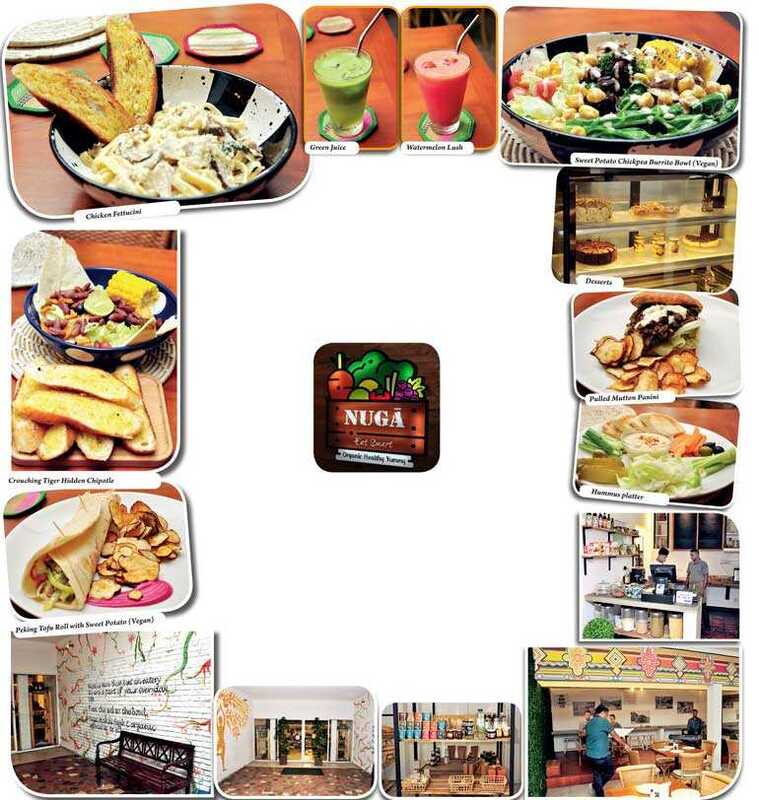 Cafe Nuga does a lot of things right, from their varied – Mexican, Italian, American – and healthy cuisine, to their quite reasonable pricing – especially taking into account the not-inexpensive nature of organic produce. And while consistency issues need to be smoothened out over the coming months, we’re quite confident and hopeful that they will be around for a long time yet, as the high standard of food on offer when everything hits the mark is quite outstanding. Open from 11:30 a.m.-10 p.m. daily, they also have a no corkage policy (which could do with a little more publicity, all things considered) so feel free to bring a bottle, or two, of wine along for an enjoyable evening out, in what is probably Colombo’s healthiest restaurant.